Little Farley is a cosy, romantic holiday home for couples near Farley, close to the Wiltshire/Hampshire border. The cottage is detached and situated on the owner's 24-acre farm, within Bentley Woods, a Site of Special Scientific Interest. The cottage has one double bedroom and an en-suite shower room in the eaves, with stairs leading down into an open plan living space on the ground floor. This room holds a kitchen and a breakfast bar for two, plus a sitting room. Outside is off road parking for two cars, bike storage and an enclosed patio garden with furniture and a barbecue. 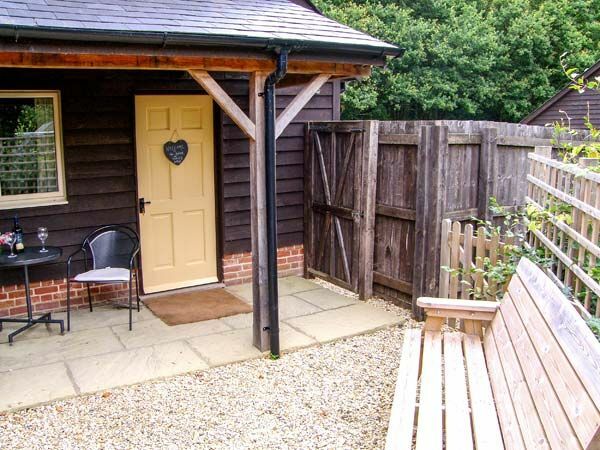 Perfect for a tranquil romantic getaway, Little Farley is sure to delight! Amenities: Oil central heating. Electric oven, induction hob, microwave, fridge, washing machine, TV with Freeview, DVD, WiFi, selection of books. Fuel and power inc. in rent. Bed linen and towels inc. in rent. Off road parking for 2 cars. Undercover bike storage. Small enclosed paved and gravelled patio with furniture and BBQ. Two well-behaved dogs welcome. Sorry, no smoking. Shop 3 miles, pub 1 mile. Note: Due to it being in the eaves, there is restricted head height at the sides of the bedroom. Note: There are beef cattle, sheep, horses and llamas in the adjacent fields, therefore dogs should be kept on a lead when in the garden. Note: The property is accessed through woods via an unmade and uneven track, 0.4 miles long, not suitable for low wheelbase cars. Note: WiFi on ground floor only and mobile signal is intermittent. Note: This property is not suitable for children, infants or babes-in-arms. Oil central heating. Electric oven, induction hob, microwave, fridge, washing machine, TV with Freeview, DVD, WiFi, selection of books. Fuel and power inc. in rent. Bed linen and towels inc. in rent. Off road parking for 2 cars. Undercover bike storage. Small enclosed paved and gravelled patio with furniture and BBQ. Two well-behaved dogs welcome. Sorry, no smoking. Shop 3 miles, pub 1 mile. Note: Due to it being in the eaves, there is restricted head height at the sides of the bedroom. Note: There are beef cattle, sheep, horses and llamas in the adjacent fields, therefore dogs should be kept on a lead when in the garden. Note: The property is accessed through woods via an unmade and uneven track, 0.4 miles long, not suitable for low wheelbase cars. Note: WiFi on ground floor only and mobile signal is intermittent. Note: This property is not suitable for children, infants or babes-in-arms. Little Farley was the perfect bolt hole for us and our two small dogs, with wonderful walks in Bentley Woods right outside the door, we couldn't have wished for a more relaxing holiday. The owner was so helpful and friendly we will definitely return to this wonderful retreat!